Happy Thanksgiving from the sunny strip in Las Vegas, Nevada. Family has converged here from various parts of the country. As a first-time visitor I am trying to absorb the overwhelming . . . overwhelmingness . . . of it all. I fully expected to hate it, and while I am impervious to most of the attractions I can't say that I am hating it. The mountains that surround the city are breathtakingly beautiful, as is the weather. Anthropoligically, there is something to be said for the sheer magnititude of neon (although I guess it isn't neon anymore; at least not the neon I am used to associating with Las Vegas). The water display at Bellagio was an amazing sight. The sheer commercialism and excessive consumerism are not as vulgar as I expected both to be, but are impossible to avoid. I am still trying to process it all as I have only been here one day, but it is an impressive place; whether the impression is positive or negative I leave to the individual. I have not done any gambling, nor do I plan to. But that's more because it just isn't my kind of thing and I'd rather spend my money on something that I enjoy. So far we have not eaten at any noteworthy restaurants, nor do we plan to as far as I know, but the food has been fresh and good where we have eaten. Today we will explore the bounty of the Flamingo Paradise Garden Buffet Thanksgiving spread that overlooks a 15-acre habitat that includes live pink flamingos and the biggest koi I believe I have ever seen. I expect it will be quite tasty (the buffet, not the koi). I hope your Thanksgiving spread is equally good. I jumped on the pickling bandwagon a couple of years ago. I am especially proud of my dill pickles. I've done some experimenting with vegetables and I love what the combination of sugar and vinegar does for all kinds of vegetables. I have not taken the plunge into canning yet, but that is not far off the horizon. Maybe next year. One of the things I do not like about pickled vegetables, however, is the amount of sugar involved. Granted, most of it stays in the jar with the pickling liquid and I think sugar is fine in moderation, but I try to eat as little added sugar to my diet as possible. And what sugar I do allow myself to have I would much rather get from the cookies, cakes, and pies I love to bake. So I do not pickle as often as I would like to. But I do love me some pickled beets. And Leaning Shed had the most beautiful big golden beets that I had to bring some home with me. I wanted to pickle them so I decided to do a quick online search to see if I could find a method that did not use such a high ratio of sugar to sour. As luck would have it, I found this recipe on Elise Bauer's Simply Recipes that calls for just a tablespoon each of sugar and apple cider vinegar. A tablespoon of olive oil balances the two to truly highlight the natural sweetness of the beets. I liked it so much I decided to take it that one step further and add my favorite companions to the beets and came up with this pickled beet and fennel salad with shallots and walnuts. I used red wine vinegar instead of apple cider vinegar, and soaked the shallots in it while I prepared the rest of the ingredients to mellow their bite and give them extra tang. The end result was the perfect balance of sweet, sour, tart and tangy. A sprinkling of fresh thyme gave it the perfect fresh finishing touch. To toast the walnuts: Lay the walnut pieces out in a single layer on a baking sheet and place on a center rack in a pre-heated 350 deg. F. oven. Cook until the nuts are just starting to turn brown and you can just start to smell them, about 10 minutes. (Check after 7 minutes.) Remove from the oven and place in a bowl to cool, then coarsely chop them. Leave an inch of the stems and the roots on the beets and wash under cold water, making sure to scrub off all of the dirt. Place the beets in a 3-quart saucepan and cover with cold water. Bring to a boil, then lower the heat and cook, covered, until tender, between 30 and 40 minutes. Remove from the heat and let cool. While the beets are cooling, prep the rest of the vegetables. Thinly slice the shallots and put them in a small bowl with the red wine vinegar. Set aside. Slice the fennel as thin as possible and place in a large bowl. Trim the ends of the cooked beets and peel them. Cut them into quarters and cut into 1/2-inch thick slices. Add to the fennel. Remove the shallots from the vinegar (keep the vinegar) and add them to the fennel and beets. Add the olive oil, mustard, and sugar to the vinegar and whisk briskly until an emulsion has formed. Season to taste with the salt and pepper. Pour over the salad and combine well. Add the thyme, reserving some for garnish if you're using fresh. Toss to combine. Let sit at least half an hour before serving immediately, or refrigerate. Bring to room temperature before serving. 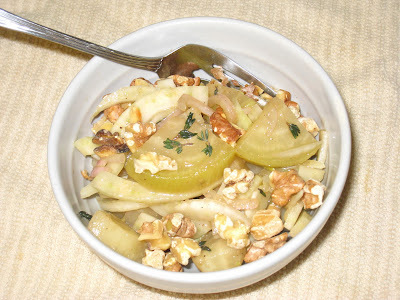 Top with a tablespoon of the toasted chopped walnuts and a few leaves of the fresh thyme. I just discovered your site (via a search for Worcestershire Sauce recipes), and I'm madly "clipping" recipes for use in my own kitchen. Thanks! A wee note: the "search this site" widget on your blog appears to be broken, as it does on all the other Blogger sites I've visited in the last few days. Perhaps a search (maybe with SafeSearch instead of directly with Google ;-)) for "search this site widget on Blogger blog" would turn up a fix or a different widget/code snippet you could add to your page. Regardless, I'm still finding LOADS of recipes that are making my mouth water. Bookmarking and blogrolling this site for regular reference. Thanks agsain! I'm glad you're finding a lot recipes, David. I've tested the search widget from two different computers and it seems to be working just fine now. But thanks for the head's up; I'll keep my eye on it.